NETWORK FINALS: The AMERICAN HOUSEWIFE rerun dropped 0.1 in final numbers. CABLE HIGHLIGHTS: The night in Discovery’s SHARK WEEK originals: AIR JAWS at 0.71, SHARK TANK MEETS SHARK WEEK at 0.66, SHARKCAM STAKEOUT at 0.61 (the night’s Top 3), and SHARK AFTER DARK at 0.35. VH1’s BLACK INK CREW was the night’s highest non-shark-related show, up 0.05 to 0.55, with HIP-HOP SQUARES at 0.36 compared to last week’s 0.29/0.29. TLC’s DR PIMPLE POPPER, waiting for its Peabody Award, climbed 0.08 to 0.54, and MY 600-LB LIFE was up 0.05 to 0.25. Bravo’s REAL HOUSEWIVES OF NYC rose 0.06 to 0.52. On MTV, CATFISH edged up 0.02 to 0.38, and the TROLLS after-show was down 0.02 to 0.29. Paramount’s newly-renewed YELLOWSTONE was up 0.02 to 0.33. Comedy Central’s THE DAILY SHOW continued a strong stretch at #15 with 0.31. On HGTV, HOUSE HUNTERS ticked down to 0.30, HOUSE HUNTERS INTL shed 0.04 to 0.26, and PROPERTY BROTHERS was down 0.04 to 0.26. On ID, REASONABLE DOUBT gained 0.05 to 0.30, and BROKEN TRUST was up 0.04 to 0.26. MSNBC’s RACHEL MADDOW SHOW led cable news at 0.30/0.45/3M, with Fox News’s HANNITY (due for a big bump on Thursday night with his Roseanne Barr interview) at 0.28/0.50/3.5M, and CNN TONIGHT at 0.21/0.29/1.1M. On Food Network, GUY’S GROCERY GAMES grew by 0.06 to 0.29. TBS’s FULL FRONTAL lost 0.03 to 0.29. On A&E, OZZY & JACK’S WORLD DETOUR fell 0.04 to 0.23, and WAHLBURGERS held at 0.15. On USA, SUITS dropped 0.06 to 0.22, and the series finale of COLONY was down 0.03 to 0.13. 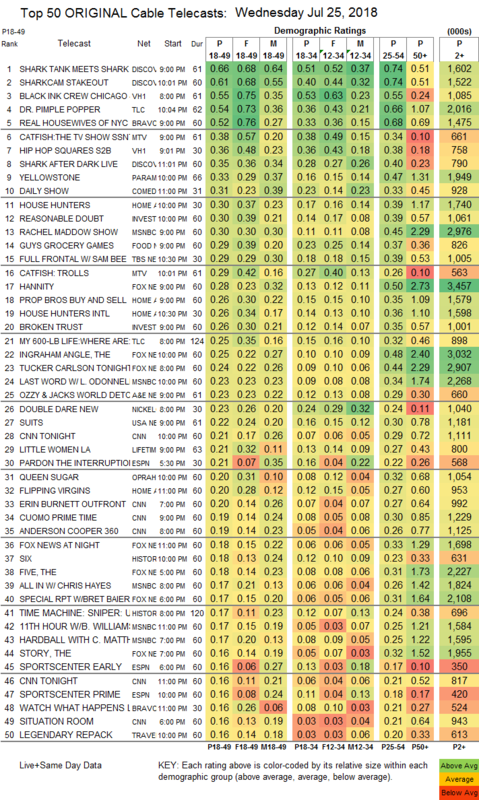 On Lifetime, LITTLE WOMEN was steady at 0.21, and SEATBELT PSYCHIC was at 0.11/0.10, compared to last week’s 0.09/0.09. OWN’s QUEEN SHGAR ticked up to 0.20. History’s SIX rose 0.03 to 0.18. 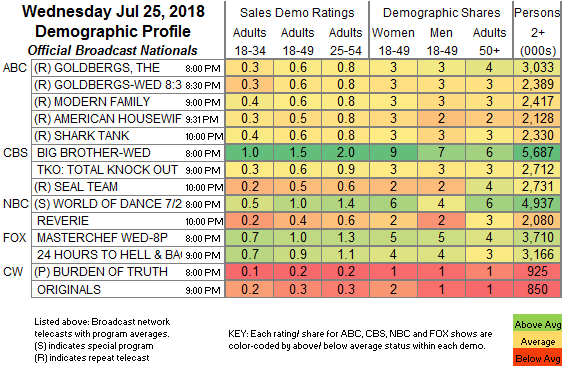 The series finale of Freeform’s YOUNG & HUNGRY was at 0.14/0.14, compared to last week’s 0.08/0.08. El Rey’s LUCHA UNDERGROUND remained off the chart, down 0.01 to 0.02/125K.